Preheat oven to 400°F. Line a large sheet pan with a Silpat. Stir together the flour, sugar, baking powder, salt, ginger, and cinnamon. Use a pastry blender to cut the butter into the flour mixture until it is in little pieces. Stir in the cranberry halves. Place the bowl in the refrigerator for 10 minutes to get the butter cold again. Whisk together 1/2 cup cream, egg, and zest. Stir it into the flour mixture. Use a fork to mix it all together. Continue to move the dough around and press it together using the back of the fork, but do not over work the dough. Refrigerate the dough for another 10-15 minutes. Brush the circles with the remaining cream quickly and bake for 22 minutes. Remove the pan from the oven and cut each circle into 8 wedges. Gently pull them apart and place the pan back in the oven for another 3 minutes. Remove and place the scones on a wire rack to cool. 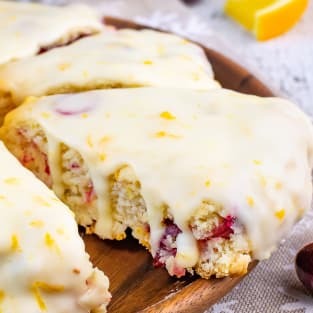 Whisk together the glaze ingredients and spread on top of the cooled scones. Let the glaze set before serving. Store in a very loosely sealed container.